Over the course of a week, we had 7 different hitters swing the Sam Bat Drop 5 hard maple sticks. These are single piece bats made just like pro bats. But, they have a drop 5 weight to length ratio—instead of the more traditional drop 3. On the whole, our hitters LOVED the feel. Why? Performance wise, although harder to hit directly on the sweet spot when compared to a over-sized composite barrel, money shots flew as well as any USA Bat we tested. However, the bat does swing at a true drop 5—a weight most younger players will find too heavy when the game is on the line. We’d recommend the drop 5 Sam Bat to any serious USA Bat or Youth Player looking for a pro level bat and its accompanying feel. If they are capable of swinging a drop 5 in a USA or youth bat, they may find opportunities to use this Sam Bat in game, too. Sam Bats drop 5 come in three different options. The fundamental difference between the three is the knob flare. Knob flare refers to the manner in which the bats knobs flare to the bottom hand. See the MC-5, KB-5 and Sam-5 in the image below. Notice the difference in knob flare between the three Sam Bat Drop 5s. From left to right: MC-5, KB-5, Sam-5. Sam-5: this has a traditional Little League type knob where the transition is abrupt. Most younger hitters will find this feel familiar. KB-5: This has a small flare. If you are not sure if your hitter will like the flare, but would like to try it out, this is the type of knob to get. MC-5: A rather large flare for a youth bat. Although technically considered a medium flare when compared to MLB type bats. This is a significant flare. It is our personal favorite, but we hit a lot with wood bats. Sam Bat has made one kind of bat since they broke into the MLB game several years ago via Barry Bonds. The Sam Bat is single piece of Maple made from Canadian hard wood. When Barry Bonds and Sam started using pure maple bats in the MLB most were skeptical. Ash bats ruled the day. Now, however, the vast majority of MLB players swing Maple bats. They prefer the hardness of the maple and the bats durability. In other words, Sam Bat is the original maple bat company. You can expect the highest quality of construction and wood choices when hitting with a Maple Sam Bat. Few things in life sound better than a bat on a pure maple stick. Many major companies make a single piece wood bat in a drop 5. However, not all of them have caught up to the idea of making a drop 5 in something bigger than a 2 1/4 barrel. After a bit of searching, we found a couple of options in on Meridian bats and Warstic bat’s site. We struggled to find them in a size longer than 30-inches (Sam Bats go up to 32-inch). Both Meridian and Warstic make high quality bats. If you want to try others, we would be confident you could convince one of the smaller wood bat companies to put together a custom bat for you. Find their contact information from their site and send them an email with the request. Our experience with small bat companies is that they’d love to be helpful. Can You use a drop 5 Wood bat in BBCOR? No, actually. To be BBCOR approved the bat cannot have a higher drop than a 3. The drop, we are sure you know, is the numerical difference between the weight of the bat in ounces and the length of the bat in inches. A drop 5, as these Sam Bats are, would not be legal in a league that requires BBCOR. I spent a bunch of time like you trying to find a good 30″ wood bat for my 12u son. I ended up buying the Mizuno MZM 271, it’s 30/27. I didn’t realize there were -5 wood bats out there or I probably would have done that instead, the -3 can be a bit heavy, but really forces him to get his weight moving and swing strong through the ball. Like you said, wood bats are no very forgiving on mishits, improves your knowledge (their knowledge) of where the sweet spot is and why it’s important to hit the ball there not only for the reason of hand sting, but distance off the bat. 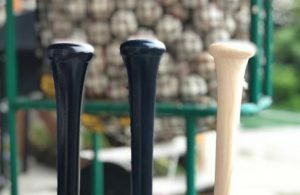 Great write up about the usefulness of wood bats in the USA Bat space. Thanks for taking the time.